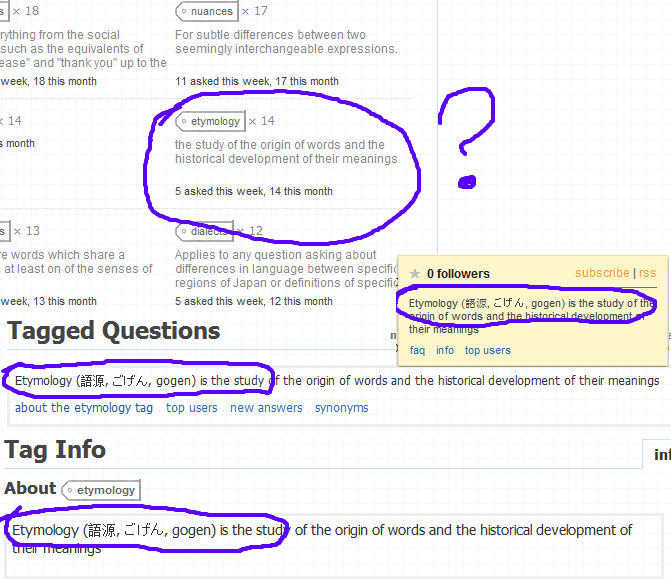 I was looking through the tag excerpts and I noticed the Etymology excerpt that appears on the Tags page doesn't match what appears on the tag pop-up tooltip, the etymology tagged questions page, or the etymology full wiki page's excerpt section. I don't see anything that stands out as the reason, especially since tags like particle-ni and kana have both kana and parenthesis in the exerpt which shows up on the page. Some long excerpts are trimmed to three sentences on the Tags page, but that's not the case here either, because there's a full line open. Is this a bug? Looks this way on both Chrome and IE. Looks like it cuts off anything before the word "is," probably in an attempt to avoid restating the tag's name. Clever in theory but buggy in practice. Applies to any question that is asked about the differences between two or more words or phrases and how to select the best one for a given situation. asked about the differences between two or more words or phrases and how to select the best one for a given situation. Not the answer you're looking for? Browse other questions tagged bug status-bydesign tags tag-wiki . Should we consolidate the history and etymology tags? Isn't the [grammar] tag too general or redundant? Usage tag - isn't it too broad?